The European Union in Singapore presents the 29th edition of the European Union Film Festival (EUFF) from 10 – 19 May at National Gallery Singapore. EUFF reflects the diversity of perspectives, histories and cultures from across Europe. Featuring the best of contemporary European cinema, the 29th EUFF presents 27 films from across Europe with Romania as the featured country this year. Romanian film Beside Me will open the festival. Films screened are recent and have encountered success in their country of origin. The films showcased in this festival may belong to a specific country, but they are all representative of Europe’s common cultural heritage. This film festival is not just a window into the intriguing world of European cinema but also offers a platform to showcase films by young Singaporean filmmakers. The Festival continues EUFF’s long tradition of collaborating with a Singaporean film school. Partnering for the fifth time with Ngee Ann Polytechnic’s School of Film and Media Studies, the EUFF features short films by students and alumni of the school alongside the official film selection. The German European School Singapore (GESS) also returns for the third time as the Title Sponsor of EUFF. At the 29th EUFF, audiences in Singapore are invited to discover the many facets of Europe, through a wide variety of thought-provoking films. The Festival opens with the film Beside Me, from this year’s Featured Country, Romania. The film is the directorial debut of Tedy Necula. It explores the idea of human connectivity in a cramped space as the story revolves around several passengers who are locked in a subway station. They do not know each other, have different routes, with different problems. But as passengers interact, things start to change. Beside Me is a telling reminder that we are all strangers until something brings us together. The cast reunites some of the biggest names of Romanian cinema. Several films in this year’s Festival are based on the extraordinary lives of European personalities. Two eponymous films – the Czech Republic’s Jan Palach and Greece’s Kazantzakis are about individuals who have left a lasting impact on their country’s history and society. The Czech film portrays the last six months in the life of Jan Palach, the philosophy student who self-immolated to protest against the Soviet invasion of Czechoslovakia to crush the Prague Spring. The Greek film Kazantzakis reconstructs the life and journeys of the titular Greek author, whose name became synonymous with his rebellious spirit. Poland’s The Art of Loving The Story of Michalina Wislocka is based on the compelling and controversial life of gynaecologist and sexologist Michalina Wislocka. The film depicts how the most famous sexologist of communist Poland took on the censors, fighting for the right to publish her seminal book on a once-taboo subject. Austria’s Mademoiselle Paradis, Denmark’s A Fortunate Man and Portugal’s Pilgrimage draw from the rich tapestry of European history. Mademoiselle Paradis tells the real-life story of blind musician Maria Theresia von Paradis and pioneering physician Dr Franz Mesmer. A Fortunate Man by auteur Bille August, a filmmaking icon and recipient of the Palme d’Or, the Academy Award and a Golden Globe, draws on writer Henrik Pontoppidan’s influential coming-of-age Danish novel Lykke Per recounting the story of Per Sidenius, an ambitious young man from a devout family in Western Denmark who rebels against his father. Portugal’s Pilgrimage is partly based on a book first printed in 1614 that details Fernao Mendes Pinto’s departure to the East in search of a better fortune. What follows is an adventurous and unforgettable 20-year journey so amazing that no one would believe it. A look back at modern history is Estonia’s The Little Comrade, a film set in the midst of Stalinist tyranny, which tells the story of six-year-old Leelo whose mother has been sent to a prison camp. The tale of friendship, love and family permeate through several of the Festival’s films. Belgium’s le Ciel Flamand zooms in on the lives of three generations of women – Monique and her daughter Sylvie who run a brother, and Eline, Sylvie’s six-year-old daughter who is fascinated by the mysterious workplace of her mother and grandmother, but she is never allowed inside. The French film, Remi, Nobody’s Boy, tracks the endearing adventures and misadventures of Remi who was raised by a kindly peasant woman after being found as a baby. A compelling social drama addressing the universal need for love underlies Lithuania’s film Sasha Was Here, which centres on a middle-class couple who end up adopting a rebellious 12 year-old boy. Spanish film La Novia is based on a widely revered Spanish play Bodas de sangre (Blood Wedding), penned in 1933, which tells of the escape of the bride on her wedding day with her secret lover, resulting in devastating consequences. The Stolen Princess from Ukraine, an animated fantasy, is a romantic story that takes place in the times of Kyivan Rus – the age of valiant knights, beautiful princesses, and battling sorcerers – which seeks to find out if real love and indeed be stronger than magic. EUFF showcases some of the best European action-packed thrillers and suspenseful mysteries and dramas. Bulgaria’s Omnipresent revolves around Emil, writer and owner of an advertising agency who gradually becomes obsessed with spying on his family, friends and employees via hidden spy cameras. What starts as an innocent hobby morphs into an addiction. In The Whisky Bandit form Hungary, the distinct aroma of whiskey was the only clue the man behind 29 bank heists in Budapest would leave behind. Turkey’s Once Upon a Time In Anatolia, the 2011 Cannes Film Festival Grand Jury Prize winner, is set in the Anatolian countryside where a group of men including a police commissioner, a prosecutor, a doctor and a murder suspect go in search of the victim of a brutal murder only to have their own secrets spill on a slow boil. The Maltese film The Weeping House of Qala is a tale of mystery where a film crew tries to solve a 40-year disappearance. The Wave, Norway’s film is a Nordic action-packed thriller about the collapse of the mountain pass above the scenic, narrow Norwegian fjord Geiranger, creating an 85-metre high violent tsunami. The Wave is widely known as the “first Scandinavian disaster movie”. No festival would be complete without music and some laughs. Some of the funniest European films will be featured at EUFF 2019. Germany’s Magical Mystery Or: The Return of Karl Schmidt is a comedic and techno-infused road movie through Germany, following the adventures of Karl Schmidt who takes on a job driving a tour bus after his nervous breakdown. Irish coming-of-age musical comedy, Sing Street, has been hailed by critics as “a pitch perfect” reconstruction of Dublin teen life in the 1980s. Italy’s Magical Nights set in Rome in 1990 against the backdrop of the semi-final between Italy and Argentina at the FIFA World Cup is a bittersweet comedy about three young aspiring screenwriters who are the main suspects of a murder. In line with the Festival venue at the National Gallery Singapore are two films about art – Finland’s One Last Deal and Latvia’s Homo Novus. One Last Deal, directed by Oscar-nominated director Klaus Haro tells the tale of an elderly art dealer who wants to find that ultimate piece of art in order to prove himself. Homo Novus is a celebration of life and art set in the Latvian capital of Riga in the 1930s where artistic circles and bohemian lifestyles are synonymous. Enter Juris Upenajs, a poor, young, ambitious man from the countryside who wants to make his mark in artistic circles. Three documentaries feature in the Festival this year. The Netherlands’ The Wild City shows us the many sides of the Dutch capital Amsterdam from the unique perspective of the many wild animals and plants that inhabit it, brought alive through the eyes of the adventurous urban cat, Abatutu. Eldorado, a documentary from Switzerland, tells the compelling human story of refugees – their hopes, their dreams and often their dashed aspirations. The United Kingdom’s Power in Our Hands, a groundbreaking documentary tells the story of the deaf community in Britain. It presents the long and arduous campaign of the community for its right to be heard and for their language to be recognised. 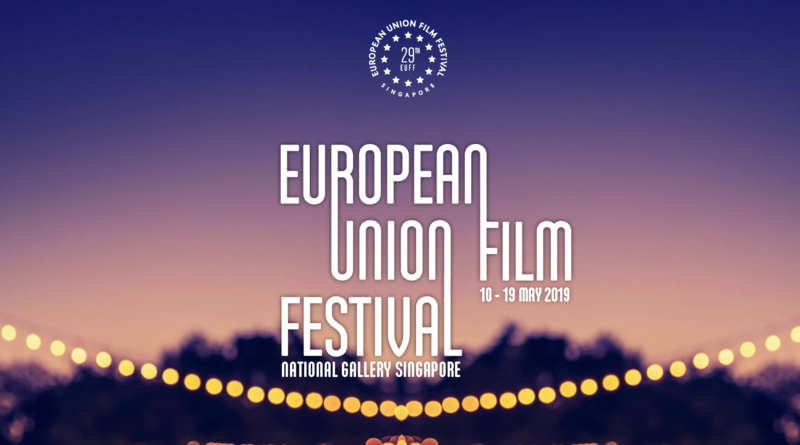 The EUFF will take place from 10 – 19 May 2019 at the National Gallery Singapore’s Ngee Ann Kongsi Auditorium (Basement 1). For ticket sales please visit SISTIC. For more information and updates on the 29th EUFF, please visit EUFF.